What's all included in the rental? Access to the entire property, parking for 225 guests, bridal suite, grooms loft, kitchens (there are 2 of them), outdoor ceremony space including chairs, and all reception tables and chairs. One hour rehearsal time. What are the hours that we have access to the property for our event? Friday, Saturday and Sunday rentals include 12 hours of access to the property. Friday and Saturday events are available until midnight and Sunday rentals are available until 10pm. A 50% non-refundable deposit is required to secure your rental date. The deposit balance of your rental price is due no later than 30 days prior to your event. A $1,000 damage deposit is also due 30 days prior to your event. Are there hotels near by? Yes! 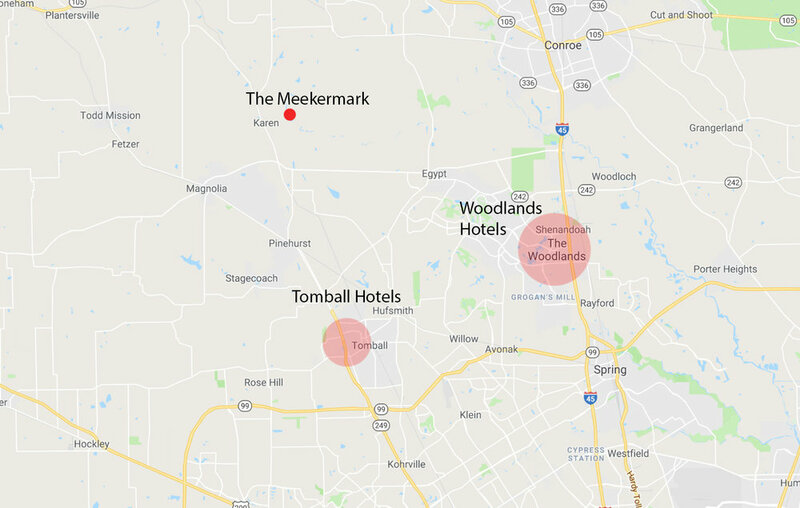 There are 4-5 name brand mid-priced hotels in Tomball just 20 minutes from The Meekermark. There are also 2-3 top-tier name brand hotels in The Woodlands which is also just 20 minutes away. The Woodlands is an entertainment destination featuring lots of great restaurants, shopping and things to do for your our of town guests. Have more questions? We'd love to discuss your event with you in person. Please contact us for more information.